GQA Qualifications: Vintage Windows enhance their knowledge with Mount Training Solutions. Vintage Windows enhance their knowledge with Mount Training Solutions. Derbyshire based Company, Vintage Windows, is celebrating the achievement of three of its fabricators who have recently gained their Advanced Apprenticeships in the Fabrication of Glass Supporting Structures through the GQA Approved Centre, Mount Training Solutions of Wolverhampton. 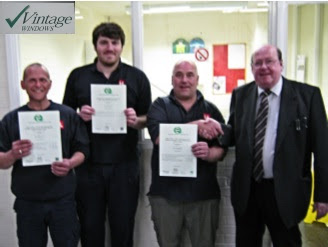 Lance Robinson, Production Manager is pictured with Paul Hibbitt and Dean Hurrell receiving their NVQ Certificates from GQA External Verifier, Tom Steele. Lance commented that he and his team found that the programme had enhanced and confirmed their knowledge and competence in the workplace in line with business needs to ensure success. Lance also mentioned that as a result of this successful venture, three more of the team are now on track to complete their Advanced Apprenticeships by the end of 2014.